Larry Dean is an award-winning comedian and writer. Since being crowned Scottish Comedian Of The Year at just 23, Larry’s star has continued to rise and rise, with his debut Edinburgh Fringe show Out Now! receiving widespread critical and audience acclaim as well as a Foster’s Comedy Award nomination for Best Newcomer. Following his success in Edinburgh, Larry brought the show to London in January 2016 for a series of packed out performances at The Soho Theatre and then on to the Melbourne International Comedy Festival where he was one of the standout performers on the Allstars Supershow Opening Night Gala. Larry returned to Edinburgh in 2016 with his eagerly awaited new show Farcissist, for which he won the Amused Moose Comedy Award for Best Show. He subsequently took the show on a UK-wide tour. 2016 saw Larry perform stand-up on Live From The BBC ?on BBC2, having already appeared twice on BBC Presents: Best Of The Edinburgh Festival and Live From the Comedy Store for Comedy Central. 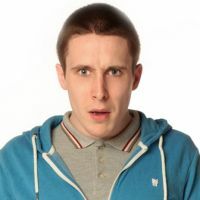 He has appeared alongside some of the biggest names in UK comedy, having supported the likes of Eddie Izzard on tour, and was also invited to perform at the prestigious Montreal Just For Laughs Comedy Festival. Larry has also performed at the iconic Sydney Comedy Store, Dubai Comedy Store and twice at Adelaide Fringe (in 2014 and 2015).